While I do have a penchant for critical darlings and conceptual oddities, let it not be said that I look down on the gaming's mega hits. On the contrary, some of my favorite recent titles have been pure popcorn and soda. Luckily for me, and the medium overall, it is not unusual for great games to exist simultaneously as a retail colossi and models of outstanding game design. Sadly, this is not the case when it comes to Lego Star Wars. Lights...Action! Wait, Aren't We Forgetting Something? In Lego Star Wars, the camera is the deadliest foe the player faces. They have no control over its movement, and the gaggle of Lego avatars tend to get separated from each other, especially when playing co-op. 1. Zoom the Camera back when the players get separated, thereby allowing for an unobstructed view of play. 2. Lock the camera so that its movement, as well as the players' progression, is linked to the slowest player. This way, the fast/skilled players can't leave the slow ones behind and advancing is tied to the weakest link in the chain. 3. Allow a player to be left behind but then warp them back to the leading player. There may be a penalty for the player who must be warped, but at least it keeps the party together. Lego Star Wars implements its own maddening take on these three concepts. The camera is basically fixed: regardless of how many characters and players, there is no zooming out. When the lead player tries to advance, they can actually "drag" the camera along with them, thereby creating invisible walls that push the other players. When Hanah and I were playing the game, it was not unusual for one of us to be knocked off a platform simply because the other person walked a bit too far away from the field of view. If this were not enough, sometimes the camera would let another person fall behind, completely out of frame. In this case, it would not warp the lost person back in to the fray. Instead, it would sign the lost person out of the game, giving the AI control where there was once a human. This added layers of confusion and annoyance as we continually had to sign back in to the game to take control of characters over which we had inexplicably lost control. Lego Star Wars forces the player through a world ill-equipped to facilitate successful navigation. The combination of oddly strewn ledges and a camera angle that fails to convey their distances and angles leads to a maddening series of false starts and re-tries. Unlike LittleBigPlanet, Lego Star Wars does not lock its characters to specific spatial planes. Because of this, even walking across a bridge is a major accomplishment, as the camera tends to constantly shift. Starting across a bridge, the player's destination may be to the left, but due to the endlessly fickle camera, "left" may become "up" halfway across the bridge. Another particularly strange and enraging quirk concerns the transition between level sections. In some cases, the door to the next room will be on the right side of the screen, necessitating the players move right to advance. However, after the screen loads, the player often finds themselves oriented in a way counter to the direction they were moving in the previous screen. Unless a game is trying to make an artistic statement about cognitive dissonance, if the player leaves one screen from the right, the next screen should generally place them on the left side of the new screen. This fosters level cohesion and a sense of geography. Why implement a navigational system that changes which way "up" is after every screen? Real Lego blocks are about exploration, creativity, and discovery. Though each set comes with instructions of how to build the picture on the box, other examples are shown to incite players to create their own rules, and employ their imagination while at play. Lego Star Wars initially drew me in with its nods to the classic toys, but I soon saw that, while it looked like Lego, it was nothing like playing with actual Lego. For a game based on a building block toy, there is remarkably little building. Every so often there is a shimmering pile of blocks that can be assembled automatically by holding down a button. This is a huge missed opportunity, as it prevents the player from exercising any ingenuity in solving puzzles in the game. Instead of assembling the blocks to fashion solutions of their own, the player is guided along a standardized route. While it may be ambitious to want full control over every block, even the necessity to piece some of the blocks together manually would have increased the amount of agency afforded to the player. 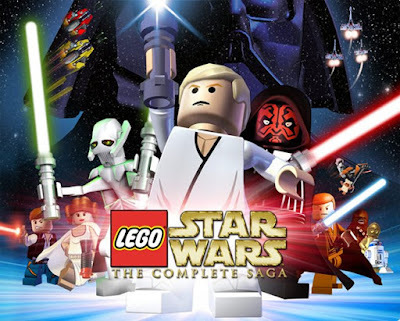 Lego Star Wars is a classic example of modern shovelware. In this came, Lego is little more than a bankable license applied as a thin veneer over rushed, technically flawed, and poorly designed games. The most disheartening thing about the whole situation is that people are buying into this, philosophically and literally. 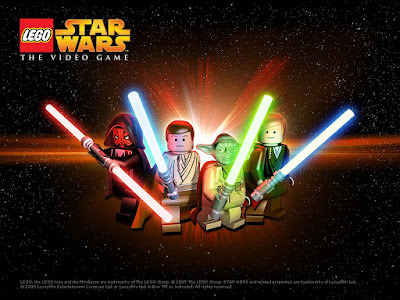 Going in to Lego Star Wars, I expected a pleasant, relaxing, if by-the-numbers, beat 'em up/platforming experience. A quick glance over the popular press reinforced the expectation that I was entering a cute, approachable game, targeted so that both kids and their parents could enjoy it. It is quite disconcerting that the conventional wisdom is that the Lego games are great for kids. While thematically squeaky-clean, no kid should be subjected to the frustration and monotony of these titles. Since when did kids need simplistic games anyway? The Super Star Wars games of the SNES seemed to catch on just fine. What if the worst were to happen? Instead of growing out of these games, children, naive and impressionable as they are, might grow accustomed to this caliber of game. The series has already moved millions of copies; what message does this send to game developers and publishers about their audience? Tomorrow's video game enthusiasts, designers, and publishers are in danger of being seduced by the Dark Side. Please, won't somebody please think of the children? I've followed the blog and podcast since about the 5th episode, and when I recently got into an argument with a friend about the merits of the LEGO games, I thought "What would XP think?" I hadn't even thought of the early Resident Evil-style disorientation as a point of criticism. It pains me to agree with the post, especially since the recent 360 Banjo Kazooie title (and yeesh, even Kingdom Hearts) have done creation better than LEGO. Shovelware is sadly apt. Good piece. Funny you should mention Super Star Wars, as it's the exact opposite of Lego Star Wars - that is it's murderously, unfairly hard. The first level alone lasts a long time and you are constantly assaulted by foes. And there's before I even mention the Jawa Sandcrawler (which is bristling with guns, has dozens of jumps that result in your falling back to the beginning of the level if you miss, and one particular jump over a pit that I have never been able to pass). I've been playing that damned game since it came out (in other words, when I was a kid) and I still can't get past that. Do kids need gentler games? No. But we don't need some of the nightmarish challenges of the old days either. Thanks for listening and for stopping by to comment, Barry. I'm assuming your friend was the one defending Lego games? I'm interested in the arguments they used. I'll have to get my hands on the new Banjo game; it's always exciting when a developer takes a franchise in a new direction. Super Star Wars was a tough game, but things got better once you got to the Cantina and Chewie became a playable character: bigger health bar and better special move. Super Empire Strikes back was always my Achilles Heel: the Bespin level and the Vader fight were RIDICULOUS! Scott, oh man, yeah. Even at the time, people thought the games were overly difficult. I remember watching a friend play through Super Return Of The Jedi in what amounted to one sitting, and being amazed. I think what's needed is games that, while not stupidly easy, don't punish so much for failure. I think of all the old Sierra adventures where you died because you didn't pick up an item three hours ago in an area you now can't return to. Or an FPS where you simply can't proceed as there's no health packs left and you've got 3% health. Nothing should be a permanent wall, but just a temporary setback requiring skill to get past it. I'm interested to know whether you've played FarCry 2. It's a pretty divisive game, but I think it approaches difficulty in an interesting way. Clint Hocking, its creator, is also very outspoken when it comes to figuring out how to structure difficulty and gameplay. His interviews are usually well worth reading. Wow, that's a negative review. I can't comment too much on the camera bashing as I haven't been playing too much co-op. It was fine in single player mode. I played one episode in co-op and can't recall having troubles. Maybe that was just luck. Generally, I found the game EXTREMLY forgiving. You have infinite lives so if I died it was never a big deal no matter who's fault it was. As for the lack of building: I think you are a bit unfair here. Having any sort of control of how the pieces come together would be impossible to pull off without sacrificing the fast pacing and the accessibility that makes the game so great. Besides, LEGO already published a free CAD program to create your own lego crations. This is an impressive piece of software but it requires a complex interface and a lot of time to get the most basic structure done. And even then, integrating it into an action game would totally steal the show. They are working on a MMO that would combine the action of the LEGO Star Wars games with the freestyle building but it's still far of right now. Freestyle building isn't what the LEGO Star Wars products are about. They are about re-imagining the well-known sci-fi saga in bricks. The game delivers. The building part is only hinted at but it successfully captures the idea - you start with a pile of bricks and build some crazy things. Sometimes you break something apart and build something new. That's what happens in the game. You may not have control over it but there is some joy in anticipating what the game characters will build next. I shat bricks when I build my first AT-ST. I realize that putting a completely realistic building element probably isn't feasible, but it still would have been nice to have a more active building option. For example, perhaps blocks of certain colors or shapes would only connect to one another, thereby limiting the amount of choices while still incorporating active construction. It is cool creating Lego versions of things, but I guess what I always liked about Lego is the customization: "Check out these sweet wings I built on my AT-ST!" For example, perhaps blocks of certain colors or shapes would only connect to one another, thereby limiting the amount of choices while still incorporating active construction. Meeh, it sounds like that's one of those ideas that sounds great on paper but doesn't actually deliver what it should when you implement it. The kind of idea you drop at some point to keep it simple ... for the relief of the whole development team. But that's all speculation. I do agree that the lack of control when building stuff seems very un-lego-ish. - Being able to create your own crazy characters out of pieces and putting weird characters together for funny scenarios. I loved that! The game even gives achievements for wacky combos like killing Vader with Anakin. - The plastic clicking sound when building. Nuff said.